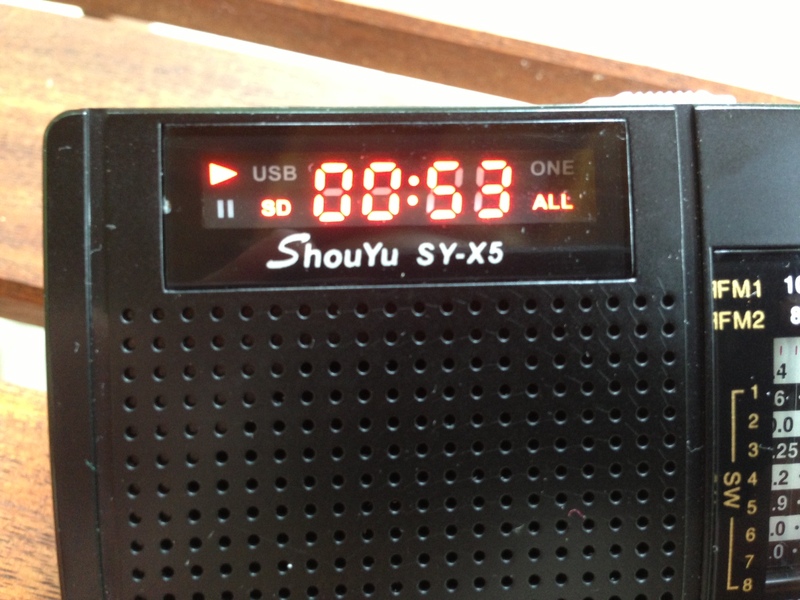 The ShouYu SY-X5 shortwave radio came to my attention only a few weeks ago. 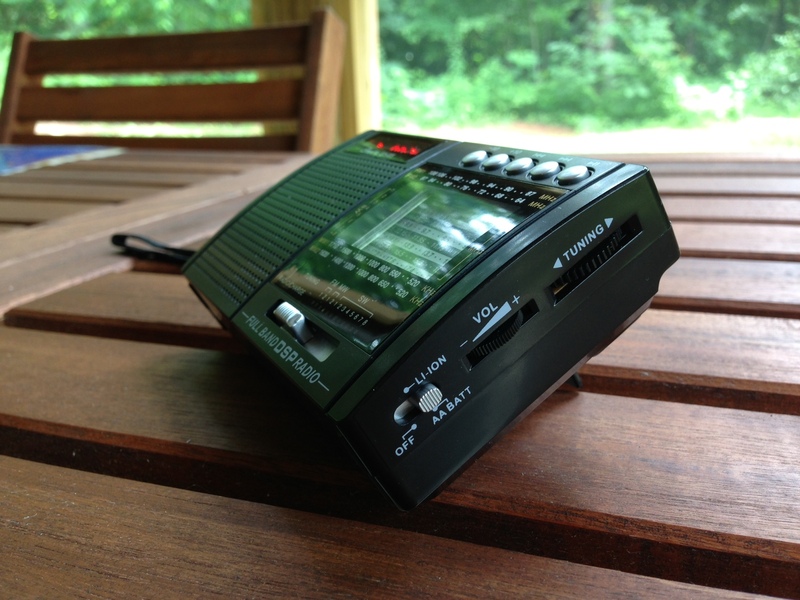 It is yet one more mechanically-tuned, DSP based, portable shortwave/AM/FM radio. I have reviewed several other models based on the same DSP chipset: the Silicon Labs SI4844–see my reviews of the Degen DE321, Degen DE32, and the Kichbo KK-9803. I also recently reviewed the Tecsun R-2010D, though it is based on a slightly newer, though similar, SiLabs DSP chipset. What makes the ShouYu SY-X5 stand out is the fact that it can be powered by either a rechargeable slim battery pack (found in the DE32) or three standard AA batteries. It also has a built-in MP3 player that uses a standard microSD card for media storage. Why are these features of particular note for me? I have been searching for a shortwave radio/mp3 player for use by my charitable non-profit, Ears To Our World. ETOW works in parts of the world where people lack mains power as well as access to the Internet (or else simply can’t afford Internet service). 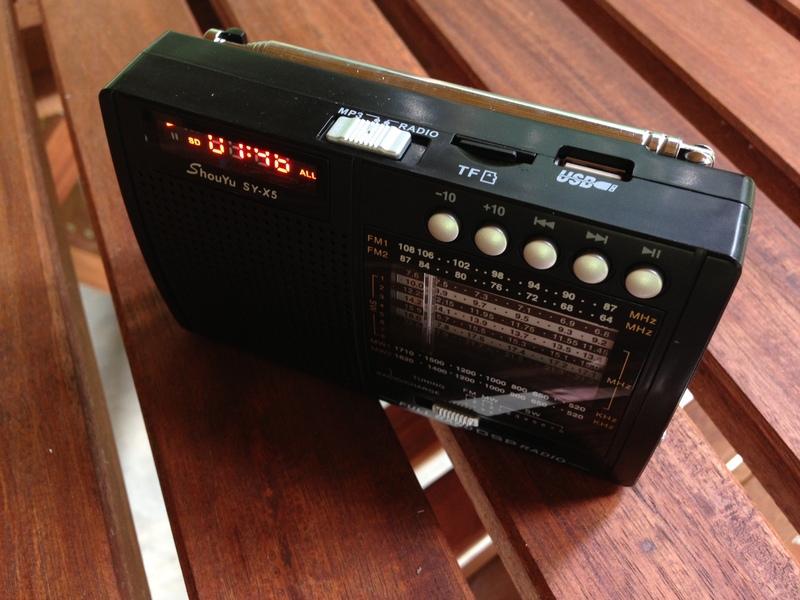 In such settings, radio allows teachers and school children to hear up-to-date international news via shortwave, and through pre-recorded educational material, they can play (and replay) MP3 content as needed. Therefore, I immediately ordered an SY-X5 for review here, hoping to donate it for use in the field care of Ears To Our World. The ShouYu SY-X5 is a small radio, almost exactly the same size as the very portable Grundig G6 and only slightly larger than the Degen DE321 (see left). It feels sturdy and even slightly heavy in your hand (no doubt, due to the number of batteries it holds). The antenna is rotatable and feels more robust than other radios in its price class. The SY-X5 has a back stand that likewise feels sturdy enough. 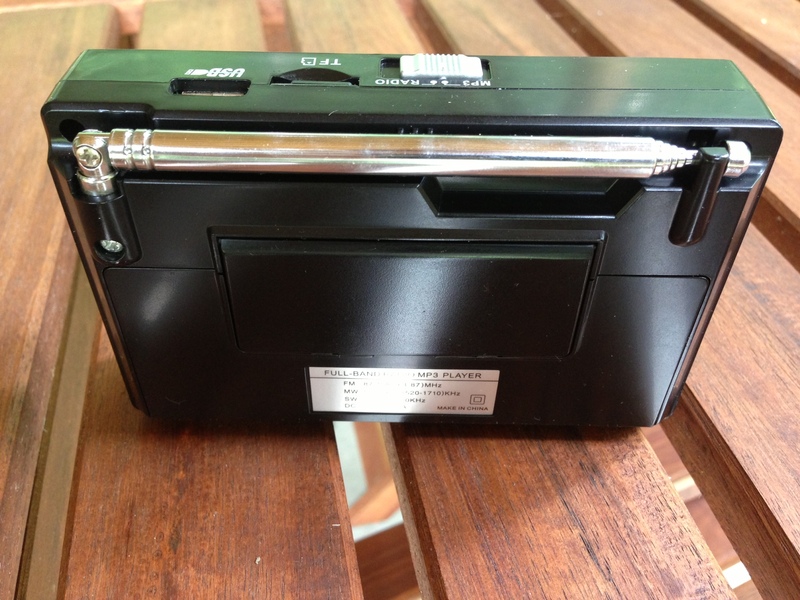 Note: to open the battery compartment, you must lift up the back stand. The overall quality is better than one might expect for $27 (US), with one notable exception: the printed frequency display behind the analog dial on my unit is positioned slightly off-center and not level, making needle position on the dial, well, frankly ambiguous. Without a doubt, the greatest aspect of the SY-X5 is the audio delivered from the built-in speaker. It is exceptional for this size radio, full and with impressive bass characteristics. It very much reminds me of the Melson M7 (not yet reviewed here) and the Degen DE1129. I’ve reviewed enough of these mechanically-tuned DSP-based radios now that I’m beginning to note performance commonalities that can only be attributed to the design of the DSP chipset itself (regardless of how they are implemented in each model of radio). Between the two FM bands, the SY-X5 should easily accommodate world-wide FM broadcasts (even Russia). The two AM (medium wave) bands are almost identical in frequency allocation, but have been set up so that one is on 9 kHz spacing and the other on the 10 kHz spacing typically used here in North America (nice touch). While the “feel” of the tuning wheel on the right side of the radio seems smooth, in reality it is not. The tension or actual mechanics behind the analog tuner are problematic; I find that upon tuning in even a strong station, when I let go of the tuning wheel, it immediately moves off-frequency. It’s most annoying. Over the course of several days of use, it doesn’t seem that the mechanism has broken in at all as I had hoped. This is perhaps the biggest negative of the ShouYu SY-X5; it is just not easy to accurately tune it. While I haven’t spent hours using the MP3 player, I find that it’s simple, yet quite effective. Most notably, it lacks fast-forward and reverse controls, though it does have buttons for ten-second skips both in the forward and reverse directions. Of course, you can pause, stop and skip to next/previous MP3 files. The SY-X5 has a dedicated MP3 player red LED display; it is very bright–almost too bright, in fact, for low light conditions–and quite simple, offering only basic functions (no alpha-numeric tags, for example). Unfortunately, I find that the LED display does inject a little noise into the audio, but it’s nothing that would deter me from using it with the built-in speaker. The ShouYu SU-X5 is very similar, performance-wise, to the Degen DE321. Out of all of the mechanically-tuned DSP portables reviewed thus far, the SY-X5 may have the best audio fidelity via its built-in speaker (save the Tecsun R-2010D). Also, like other similarly sized and priced models in this family, the SY-X5 has tuning issues; in its case, a tuning wheel that will not stay on frequency without practice. I’ve decided to take my SY-X5, on behalf of Ears To Our World, to inner Belize City in the near future. I’m going to offer this radio–together with a microSD card packed with VOA Special English programming (and a host of other English language educational materials, music and stories)–to a visually-impaired, economically-disadvantaged school child who will hopefully give this basic little radio lots of use, and perhaps even maximize its potential. While the SY-X5 has shortcomings, for this particular use–serving an individual who will not rely primarily on sight, but on tactile response, to operate it–I think it may serve its purpose. Perhaps this will be the best litmus test for the SY-X5’s utility and longevity: I may post an update when I receive feedback in approximately one year, as to whether this radio has required repair, replacement, or has offered (as I sincerely hope!) some measure of benefit to the child-owner. For the radio hobbyist, I would encourage you to skip the ShouYu S-X5 and, instead, invest in a Tecsun PL-380, PL-390, PL-398BT, Degen DE1102, DE1103, or the Tecsun PL-600. Though all are pricier, each is under $100 US, and will actually provide a lot of performance for the price. The SY-X5 and other mechanically-tuned DSP radios seem only to offer mediocre performance and a low price. Click here to search for the Shouyu SY-X5 on eBay. This entry was posted in Manufacturers, New Products, News, Reviews, Shortwave Radio, Shortwave Radio Reviews and tagged Analog DSP Radio, Degen DE1102, Degen DE1103, DSP, ShouYu, ShouYu SY-X5, ShouYu SY-X5 Review, SiLabs SI484X, SY-X5, Tecsun PL-380, Tecsun PL-390, Tecsun PL-600 on July 2, 2013 by Thomas. Can it be used only with the ac adapter and no batteries? They said it’s virtually the best DSP receiver ever issued on that price level, and especially the best in FM receiving too. I’m just a beginner in shortwave radio hobby so I wanted to avoid the hazard of having another thing I cannot fully make use of. So, even if I use it just as a conventional FM radio, it would be good choice. Thank you for giving information for me to make better choice. I wish I would have chance to tell you how lovely it works in a reply to this posting. I’d appreciate if you check it out and give your comments. Yes, Locke, let us know how well it works for you! So far, I’ve been very pleased. I got it on May. 12 (Mon), but I haven’t tested it outdoors yet. The radio felt much smaller acutally than was seen online shop photo. The FM was just plain, and the AM plain, shortwave received 5 or more Chinese or Japanese broadcasts. I have another radio with 2 bands only, Sony ICF-F10. which has good reception, I think. Compared with that, my PL-310ET seem to have equal or a bit inferior reception. Perhaps, it’s just because of the difference of the bigger speaker which sounds more soft and clear. Anyway, the noise sounds bigger on PL-310ET. 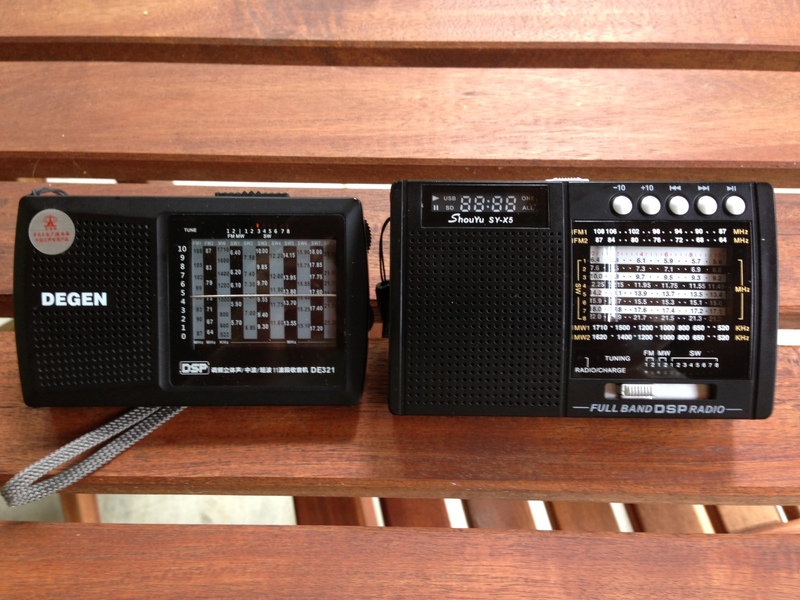 The shortwave…I have no other radios for a comparison or reference. So it was impossible for me to check how greatly it receives.the shortwave. And I have no idea about the local receiving rate of the city where I live now. Doesn’t it matter in that scale? Shortwaves are affected by the radio’s location in the room? More than the city scale? I don’t know exactly. I would have thought that’s not enough for this little radio through realtively-long-time overseas shipping from china, had it not been for the convenient functions such as ETM, big LCD, number keypads, and smart design. And I think you’re not only a good reviewer but also a good person as well for making donations to poor people worldwide. People like you inspire me and widen my thought in a sense. While I just stick to hobbies, you’re finding a way to make better world, even in your own hobby. I’m from Republic of Korea(S. Korea, as you know), and there isn’t sufficient imformation about such a minor items for radio mania, which means people like you abroad give very helpful materials that make it easier and safer for me to choose what to buy. 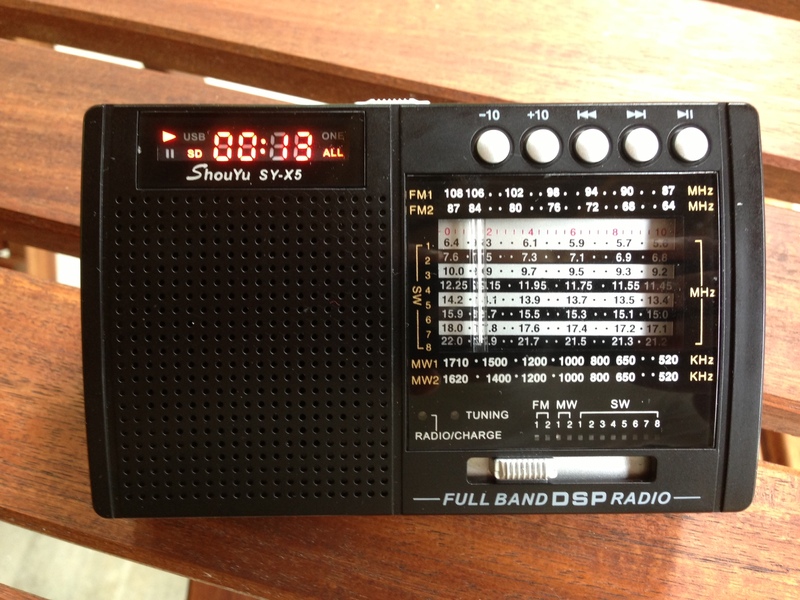 I considered buying KK-9803, KK-939B(labeled elsewhere Bigsos DH 919) or other cheaper radios as a beginners’ item. And I think I will buy Tecsun’s PL 660 some day, though I’m not sure. 😉 You helpled me a lot in making good choice. Thank you so much. Yes, I’ll sure let you know. 😉 Thank you. Have you reviewed the compact Tecsun PL 360? It is a very small radio for approx $38.00 with a portable plug in antenna and has the same Dsp chip as the Tecsun PL 380. No, I haven’t reviewed it yet, but I’ll put it on the list! Also looking at the PL-310ET. 1. Is the background noise while playing mp3 in Shouyu so bad that you will not recommend it? 2. Between truly analog radio (Tecson R909) and analog tuned digital radio (Shouyu and Degen DE321) which one would be better for ease of shortwave tuning? Personally, I would stick with the Tecsun R909; especially is shortwave listening is your goal. So, Prabhu, I would recommend the R909 in this price range. That would be my choice, at least. As per your advice and after lot of reading from swling, I took the plunge and bought my first shortwave radio : R-909. I am overall pleased with the quality of audio from the speaker. The FM and MW tuning were good. I could hear many shortwave stations, even inside my room with windows closed, with the extended antenna. I plan to go through broadcast schedules and listen specific stations; I am feeling excited to do swling. Hope the radio I received is not defective and will last. I’m looking for a radio for my Grandfather, he likes to listen to old time radio programs, I have a number of them I would like to put on an SD card for him, do you know how large of a card this will take? This seems like the perfect radio for his needs, but do you have any recommendations for a SD.MP3 player/radio? 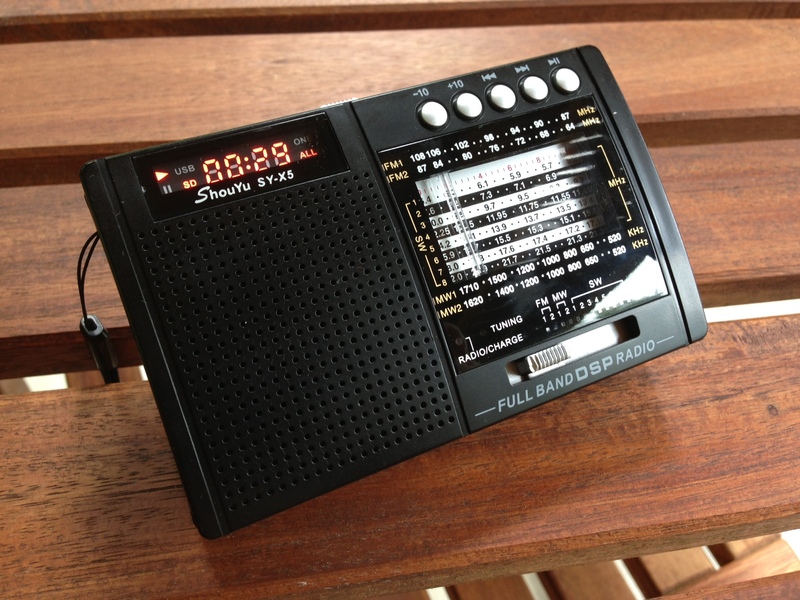 This is probably the best pick for a shortwave radio with MP3 player. It’s very simple to operate and he should have no problems reading the display. With an internal microSD card, you should be able to put 16 GB or even more in the radio for your grandfather to play. The only negative is that the player is super simple–you cycle through each program by pressing the forward button. There’s no way (I know of) to skip ahead quickly. I only had mine for 2 weeks before taking it to Belize and giving it to a visually impaired child. So far, the feedback is most positive. Good thing is, at this price, it’s not going to be a huge risk. If he didn’t care for the radio portion, you could get him an iPod shuffle or another mp3 only device. Let us know what you choose & good luck! Sounds like your grandfather is in for a treat. I’m pleased overall with my SY-DP100 labeled version of this radio. I like the heaviness; it makes the set feel more substantial. The tuning scale on mine is well-positioned and overall the radio has a professional look. Shortwave reception improves greatly when I use the included wire antenna (nice to have the external antenna jack feature! ), along with a few feet of counterpoise wire connected to the earphone jack and hung to the floor. Yes, tuning the radio takes a bit of practice on all bands, but the dial on mine turns easily with no apparent “play” or tension. MW reception is mainly limited to locals and the stronger distant nighttime stations. I do get enough MW stations to make this a useful receiver. FM is great, but again tuning can be tricky. I got my set for US$27.50 from DealXtreme (they are now temporarily sold out). 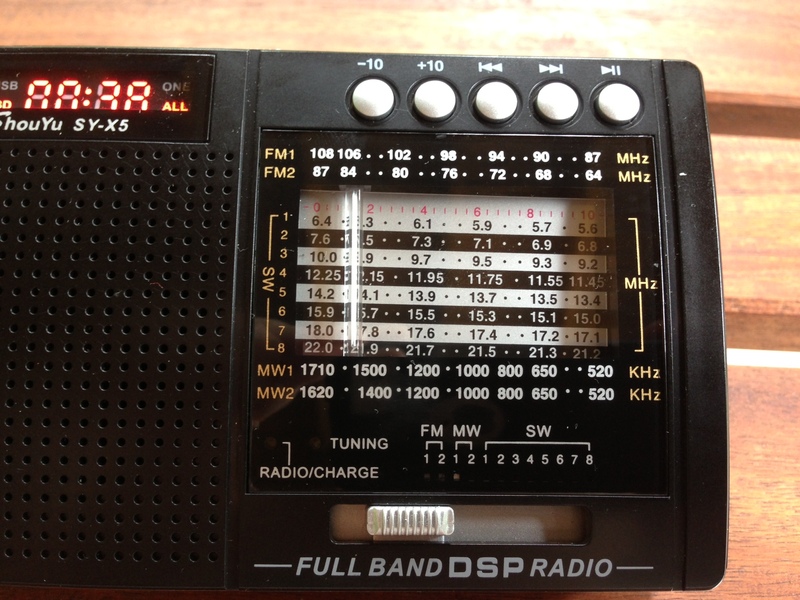 For me this radio is a keeper – I especially like the external antenna jack! You saved my US $25. I am confused what to buy under a tight budget! I narrowed my search to Tecsun R-909 for US $21 and Tecsun DR-920 priced US $26 ! I need your advice to choose the better one between them. If you can deal with the ambiguous tuning of an analog radio, I would suggest the R-909. It will probably deliver better overall performance. In all of my experience with radios under $40, I find that analog radios deliver the best performance for the price. The only negative is the lack of precise (digital) tuning. Of course, if you’re only planning to listen to powerhouse stations, I would side with the DR-920. Just make sure the frequencies you wish to target are included in its band selections. Good luck! Let us know what you choose! To my knowledge, the only method of purchasing the SY-X5, as a consumer, is via eBay. Click here for a link to eBay. I would be very surprised if Hong Kong-based sellers couldn’t deliver to your part of the world.